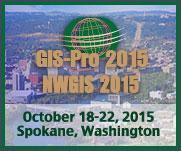 Terra GIS is offering a 2 day hands-on pre-conference workshop at the URISA GIS-Pro & NWGIS 2015 Conference – Geography at the Nexus of Collaboration. The conference this year will be held at the Davenport Grand Hotel, 333 W Spokane Falls Blvd, Spokane, Washington. The pre-conference workshop will be held on Sunday October 18th and Monday October 19th, 2015, the main conference program will continue until Thursday of the same week. Details about the workshop are here and the official conference workshop page is here.